Chapter2: Do you really want to be productive? Chapter 3 The 10% solution for increased personal Efficiency. Chapter 6 Delegations and Outsourcing. According to an article in American Demographics (Jan,1999) consumers have come to view time as their most precious commodity. “To satisfy today’s consumer, you need to do business in a real-time world- one in which time and distance collapse, action and response are simultaneous, and customers demand instant gratification”. 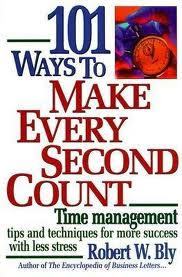 In Bob’s world “101 Way to Make Every Second Count shows you how to succeed in today’s competitive, fast-paced world by increasing your own personal productivity, so you can get more done in less time. 101 Ways… is organized into 10 quick-reading chapters. The first chapter presents proven time-saving strategies you can learn in less than 20 minutes to achieve an instant boost in personal productivity. Chapter 2 enables you to assess how important increasing personal productivity is to you…and whether you are willing to do what is necessary to achieve it. Chapters 3 through 10 present a wealth of tactics that can help you get more done in less time with less stress-with no sacrifice in the quality of the work. This chapter talks more about the motivation for increasing productivity and some guides on goals and causes/ways of avoiding job burnout. Talks about maximising time through the use of Time fillers, learning how to juggle projects and handle pressure. This is where we are shown on how to use the leverage of Technology to save us so much valuable time and increase our productivity . The book offers a myriad of ways to increase your personal productivity and save yourself from much stress either at work or even while working on personal goals or projects. COMING UP NEXT: THE MAKING OF A SUPER STAR!